Build new classes of sophisticated, real-time analytics by combining Apache Spark, the industry’s leading data processing engine, with MongoDB, the industry’s fastest growing database. The MongoDB Connector for Apache Spark is certified by Databricks, and supported for production usage today. Sign up for the free MongoDB University course to get you on the fast track to your next data science project. We live in a world of “big data”. But it isn’t just the data itself that is valuable – it’s the insight it can generate. How quickly an organization can unlock and act on that insight has become a major source of competitive advantage. Collecting data in operational systems and then relying on nightly batch extract, transform, load (ETL) processes to update the enterprise data warehouse (EDW) is no longer sufficient. 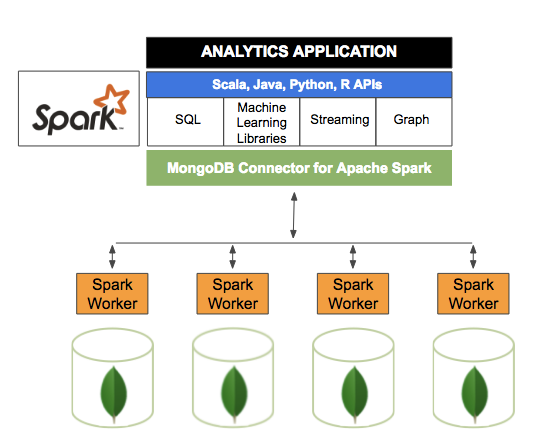 The MongoDB Connector for Apache Spark exposes all of Spark’s libraries, including Scala, Java, Python and R. MongoDB data is materialized as DataFrames and Datasets for analysis with machine learning, graph, streaming, and SQL APIs. The MongoDB Connector for Apache Spark can take advantage of MongoDB’s aggregation pipeline and rich secondary indexes to extract, filter, and process only the range of data it needs – for example, analyzing all customers located in a specific geography. This is very different from simple NoSQL datastores that do not offer secondary indexes or in-database aggregations. In these cases, Spark would need to extract all data based on a simple primary key, even if only a subset of that data is required for the Spark process. This means more processing overhead, more hardware, and longer time-to-insight for data scientists and engineers. To maximize performance across large, distributed data sets, the MongoDB Connector for Apache Spark can co-locate Resilient Distributed Datasets (RDDs) with the source MongoDB node, thereby minimizing data movement across the cluster and reducing latency. While MongoDB natively offers rich real-time analytics capabilities, there are use cases where integrating the Apache Spark engine can extend the processing of operational data managed by MongoDB. This allows users to operationalize results generated from Spark within real-time business processes supported by MongoDB. China Eastern Airlines uses the MongoDB Connector for Apache Spark in it’s new fare calculation engine, serving 1.6 billion queries per day. Qumram exposes user session data stored in MongoDB to Spark’s machine learning processes to help global financial institutions detect fraud through behavioral analytics, and to apply deep learning techniques for sentiment analysis with Natural Language Processing. Stratio implemented its Pure Spark big data platform, combining MongoDB with Apache Spark, Zeppelin, and Kafka, to build an operational data lake for Mutua Madrileña, one of Spain’s largest insurance companies. Machine learning models are built to personalize the customer experience, with analysis of marketing campaign data to measure impact and improve performance.